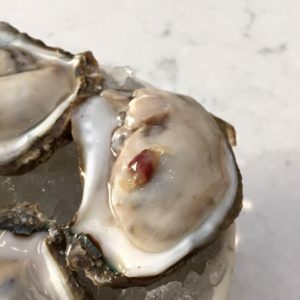 For many oyster lovers the thrill of finding the elusive, tiny, pea crabs cohabitating with their beloved bivalve is the pinnacle of eating oysters and many consider it more desirable than the much requited pearl. After all, you can’t eat a pearl and rarely are they found in multiples. My first experience with the tiny crustaceans occurred during my junior year of high school. My date had made reservations at The Ship’s Cabin, a local restaurant in Ocean View, VA, known for their seafood. Being an oyster lover since the tender age of four, I ordered the oysters on the half shell as my appetizer. Much to my dismay, there were several tiny crabs and one of them was moving about! I had never seen one before and promptly asked the waiter about it. He assured me they were a delicacy and revered by many. Even though I had been catching and picking blue crabs for as long as I had been eating oysters, I still couldn’t bring myself to eat the oyster crabs meandering around my plate. Fast forward forty years and I am now a resident of the Outer Banks where it seems the vast majority of local oysters come complete with crabs. Since my first encounter, I too have come to love them and always feel a little lucky when I shuck open that first oyster and discover the tiny inhabitants. A few years ago I found the term “slough crab” (pronounced sloo), and being a self-proclaimed “word nerd,” was curious as to its peculiar spelling. Another year passed and at Thanksgiving the oysters and crabs were plentiful and delicious! My gracious hosts had incorporated the tiny crabs into the oyster stuffing, “guaranteed a crab in every slab,” and the oyster stew. I also discovered multiple crabs in the oysters I shucked and roasted. After doing quite a bit of research I discovered some interesting facts. First and foremost was the definition of slough. According to dictionary.com a slough is an inlet, backwater, or the like. Also of interest is the fact that when I googled “slough crab”, I consistently came up with “crab slough oyster.” That got me wondering was it the oyster or the crab that was considered slough, especially since the dictionary indicated that slough was a noun. As it turns out, though commonly called a “slough crab,” the tiny crustacean is actually a pea crab, named for its body, or carapace, being about the same size as a pea. Several accepted synonyms for the oyster pea crab exist, with all deriving from the family Pinnotheridae, the family of pea crabs. The preferred binomial name is the Zaops ostreus, common name, oyster crab. Slough Crab, Slough Oyster, or Something Else? “Crab Slough is in Pamlico Sound at the southern end of Roanoke Island near Wanchese. It is a well-known area for harvesting prime oysters because the water, being near Oregon Inlet, is slightly rough. Because of the rough waters only single oysters, rather than large clumps, are formed. The water is rather brackish giving the oysters a deliciously salty taste. Frequently very tiny pea crabs, a gourmet treat when eaten whole, are found residing in the oysters. Many years ago Frank White visited New York City and much to his surprise found Crab Slough Oysters on the menu! After visiting the Joe Allen restaurant, Mr. White modified the chef’s original recipe. Get his Crab Slough Oysters recipe here. Where Do Pea Crabs Thrive? 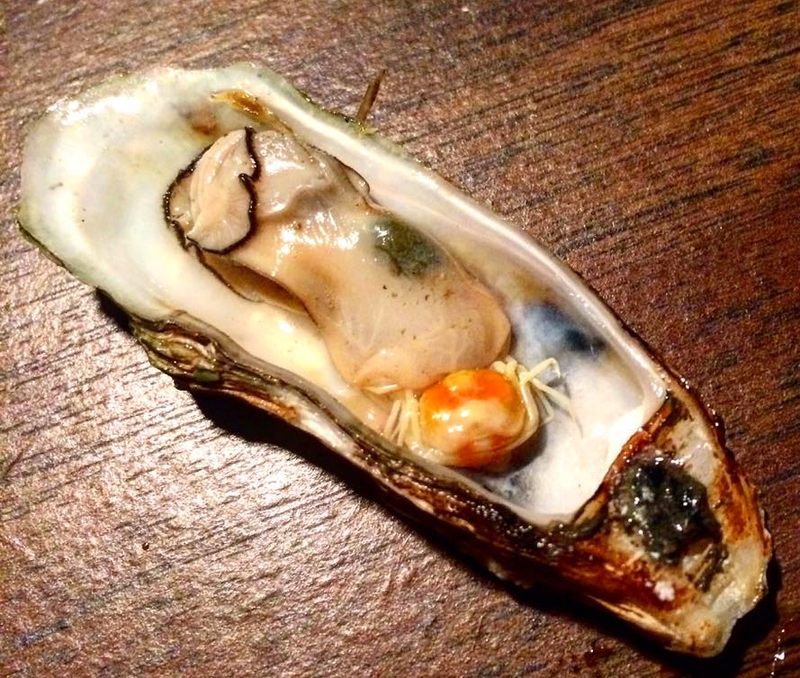 So how did that pea crab get into that oyster that wound up on Frank White’s plate in New York City? Well the answer is quite simple. Pea crabs prefer waters with a higher salinity. Sloughs are found near inlets where the sound meets the ocean providing the high salt content the crabs crave. Not only do they thrive in the higher salinity waters, they seek out the oysters via chemicals they “smell” in the water. The adult male is free-swimming and enters the oyster only to fertilize the female’s eggs and then returns to the waters where it may repeat the process. The pea crabs that one finds in an oyster are always the adult, soft-shelled females, as only the males acquire the brittle carapace needed to survive outside the oyster. They move from oyster to oyster fertilizing the females’ eggs and then die. The female lays up to 8000 eggs at a time which, once hatched, release into the waters where they seek out their own hosts once they reach the juvenile stage. 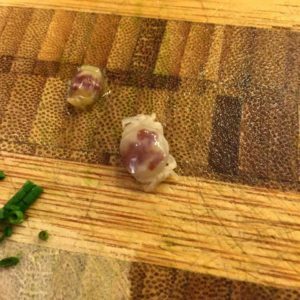 So, the next time you find a pea crab in your oyster, consider it a sign of good fortune, and impress tablemates with your knowledge. 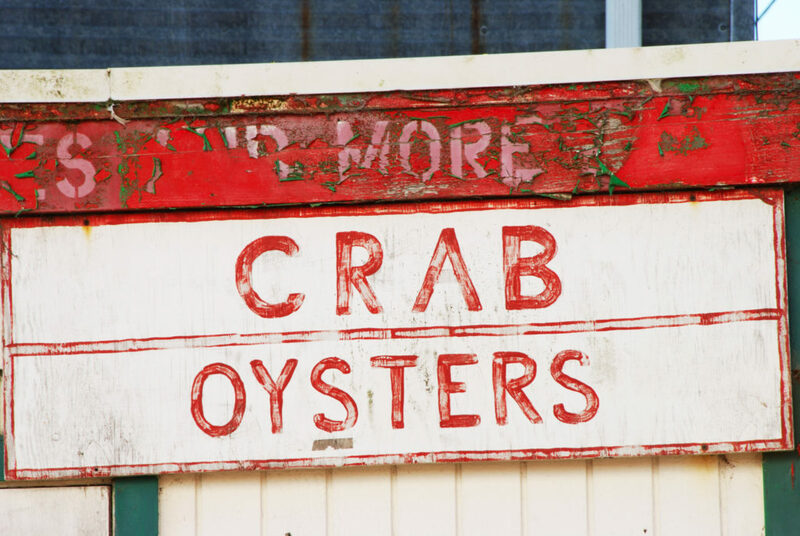 Then leave them with this perplexing question: Which came first, the oyster or the crab? And while pondering that question, why not give Frank White’s Crab Slough Oysters recipe a try? Until then, happy shucking my friends! Julie Gartman was born and raised in Tidewater, Virginia and attended her first oyster roast at the tender age of four. Between winter oyster roasts with her father, and summers spent catching and picking crabs with her grandmother, she was destined to become a lover of seafood. Julie currently resides in coastal North Carolina where she and her pack, two dogs and a cat, live happily on the Currituck Sound. Julie enjoys stargazing, landscape photography, gardening, reading, and of course, writing. Most any summer evening she can be found dining outside on local produce and seafood, enjoying the bounties of life.